Why travel to Kyrgyzstan ? With 90% of its territory covered by mountains, Kyrgyzstan is a country where the landscapes are surprisingly varied: green and flowery steppes, wooded valleys, canyons, lakes and snowy mounts. Kyrgyz people hospitality is unforgettable. Their yurts’ door is always open to you and they’re always willing to share some heat, a cup of tea, hot bread or a bowl of vodka… despite the language barrier (main spoken languages there are Kyrgyz and Russian)! Given the topography of the country, the use of 4×4 is essential: stony tracks, rivers to cross, snowy passes… Nevertheless, these are the same tracks that will allow you to access beautiful, rarely visited areas and locals for whom you will be a curiosity. It is also possible to do horse trekking, which is a funny way to experience nomadic life in the mountains. The route shown on the map below is the one we have travelled during 9 days by 4×4 (Toyota Prado) and motorcycle (BMW 750). We just improvised day after day, according to the weather, the road conditions and the advice of the locals we met along the way. We then spent 3 days doing horse trekking in the Song-Kul Lake area. 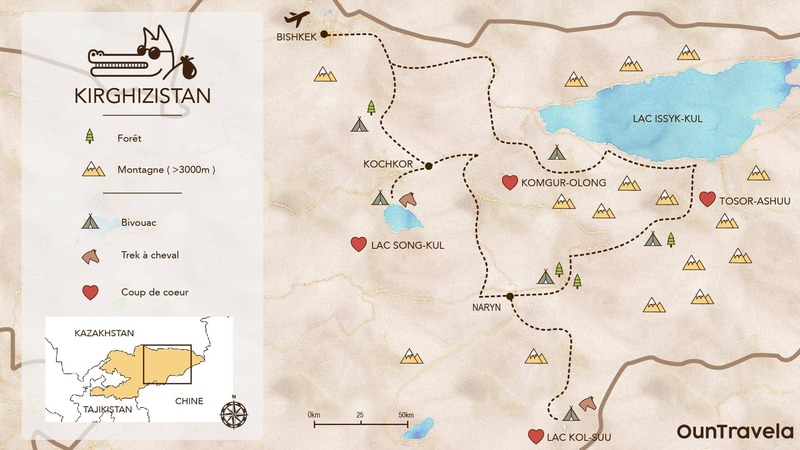 To plan your route, we recommend you to buy a map (the GIZI map KYRGYZSTAN is perfect for this) and to get a functional GPS. Main roads are very good but not numerous. You will soon come across uncertain conditions for driving (because of river flooding, landslides, closed passes). Once there, contact the CBT (Community Based Tourism Association) to find out what’s the condition of these roads. Access to the southern region of the country, bordering China, requires a special permit. You can get it in any tourism agency for a 30 dollars fee in 48h. To help you organize and plan your 4x4 and/or motorcycle road trip, we recorded our GPS tracks during our 2-week trip to Kyrgyzstan. You can download it now by filling out this mini form. Best season: Spring for the green plains and transhumance. Watch out howether for possible river floods. Warning: there are very few motorcycles and garages in the country. It’s better to book in advance and have good mechanics basics.